I booked a flight to Dublin for the weekend of the Ireland match against England in the hope that I’d find a way to sort out a ticket for the big game. 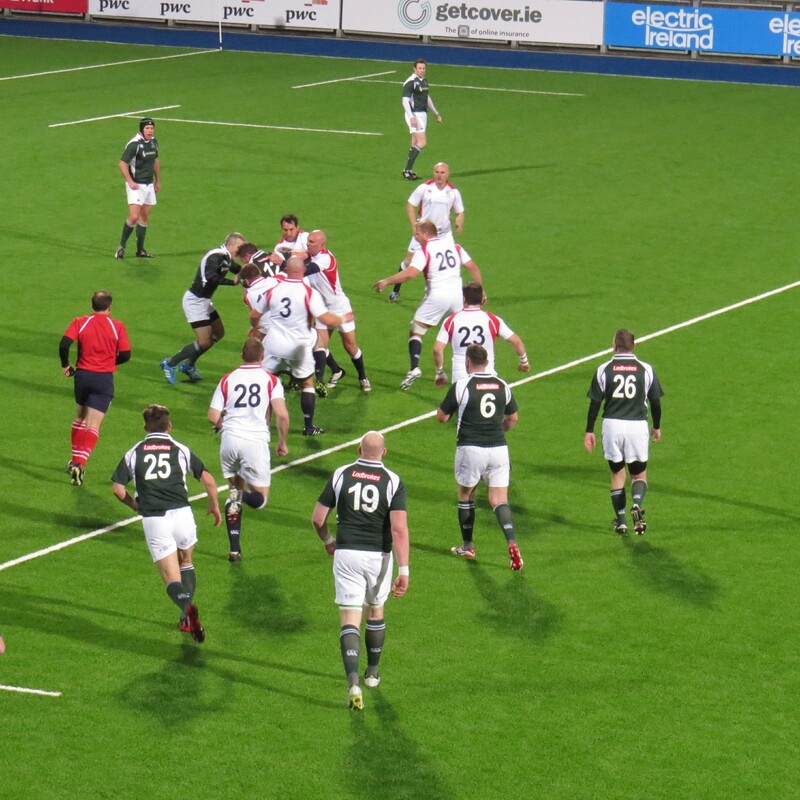 A good friend was kind enough to get me a ticket to watch the Legends game taking place in Donnybrook, so some guaranteed rugby! First of course I had to get to Dublin! I must recount a conversation with my lovely and actually quite bright (honestly) daughter as we spoke on Skype as I was getting ready to head to the airport. She asked me if I was driving to Dublin??? I did tell her that the question really rather worried me! She lives in Paris and presumed there would be a tunnel to Ireland! Oh dear me – clearly she hated Geography at school like me! Flying, naturally was the only option, I live about 25 minutes from Stansted which is ideal – not so ideal that I really quite dislike flying – especially the taking of and landing part! Bit of a snag on a 55 minute flight. I might judge that Ryanair don’t teach their pilots how to land smoothly – it wasn’t a joy! What was a joy was being met at the airport by my very lovely Twitter friend Joanne – we’ve talked on good old social media for a few years but never met. Joanne drove out to the airport to pick me up, then drove us to a really good restaurant in Clontarf. 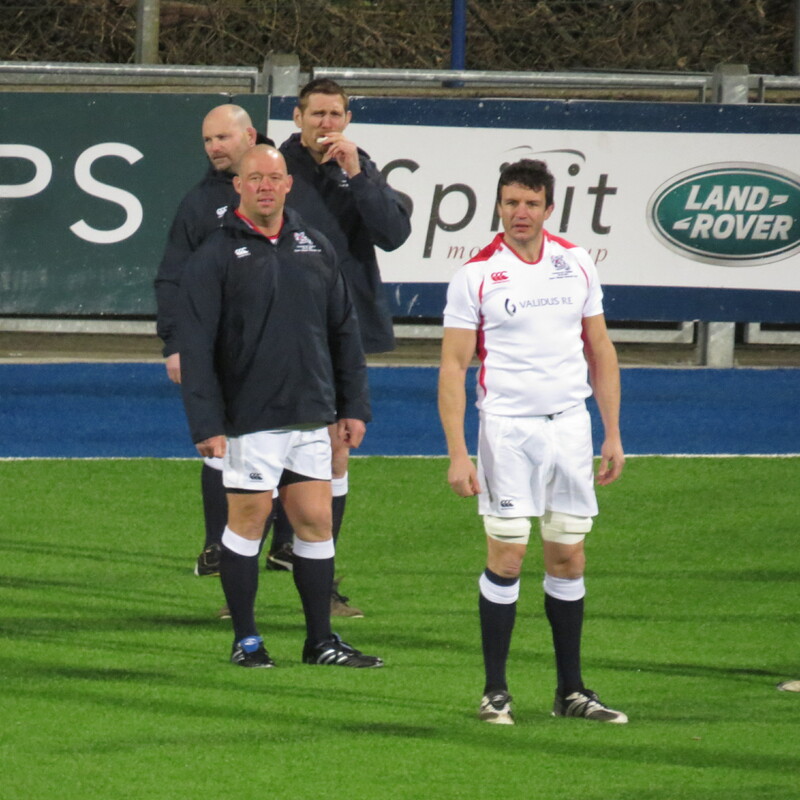 A place I was thrilled to visit having spoken to Bernard Jackman about his time there. We had a very convivial evening with very decent food and even better chat! We laughed a lot! Joanne then kindly drove met my Airbnb. My 1st experience of staying in a bed and breakfast with a difference. I was greeted very warmly by the lovely Oriana – a lovely young lady from Venezuela. A good nights sleep was followed by breakfast and a chance to catch up on my debsking.com blog. I was meeting my good friend – he of the Legend tickets for lunch and the televised games, but had time to stop in a cafe for a very decent hot chocolate. 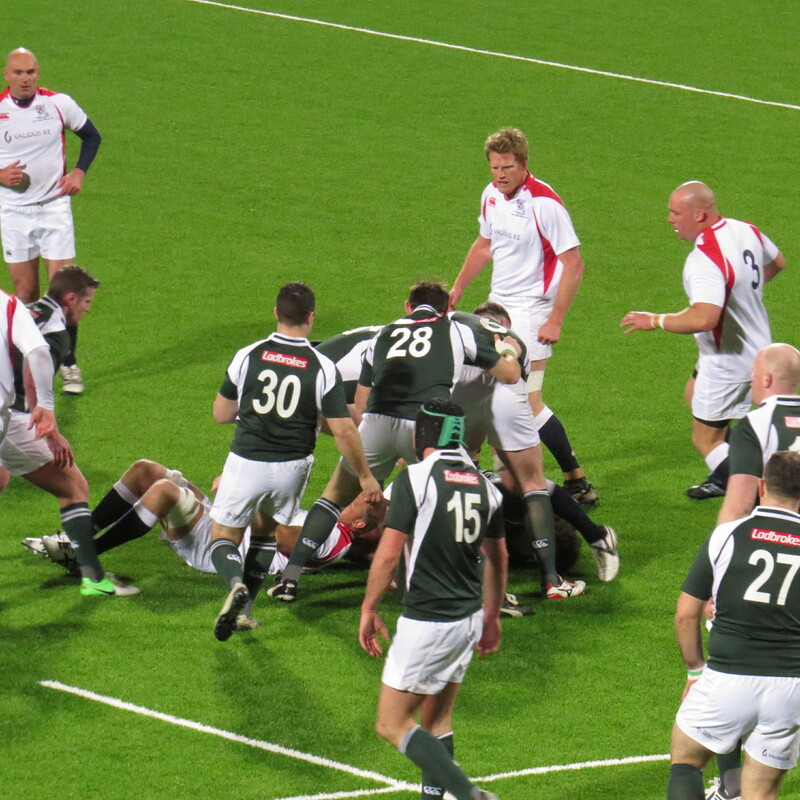 We met in The Bleeding Horse pub – I was there early and had a good chat with a Harlequins fan. It’s always good to chat rugby and interesting to hear that he and his group of friends had made the trip to Ireland many times, making use of the package offer to secure a ticket. My friend arrived just after the Scotland v Italy game had started and we watched until the end – a surprise win of Italy. 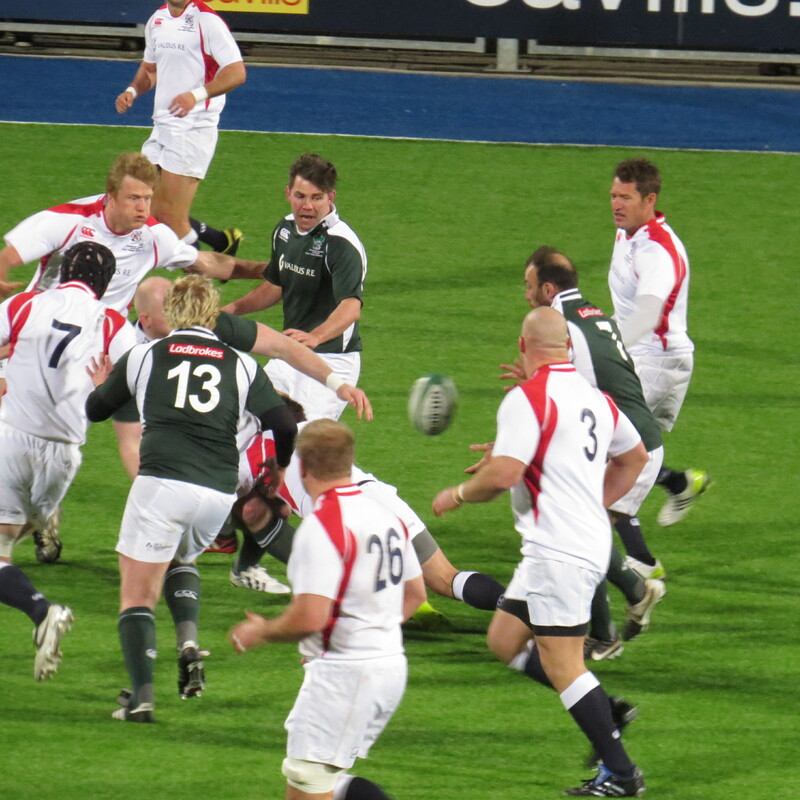 I think every neutral in rugby always wants to see these men who play their hearts out win a game – just not against your own team! 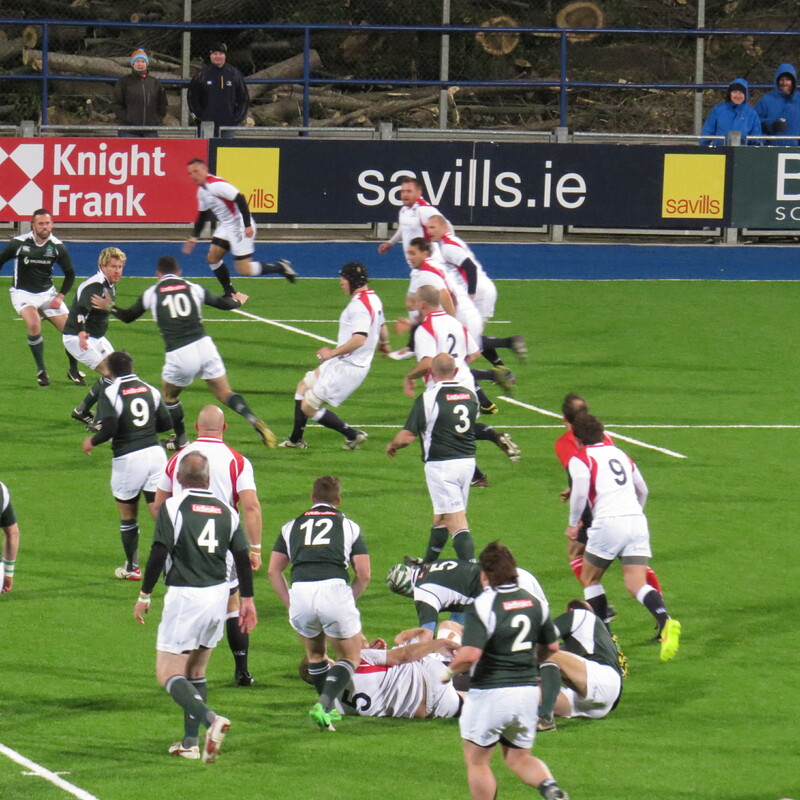 We drove to Donnybrook and arrived at Kiely’s pub just in time for the start of the France v Wales match. 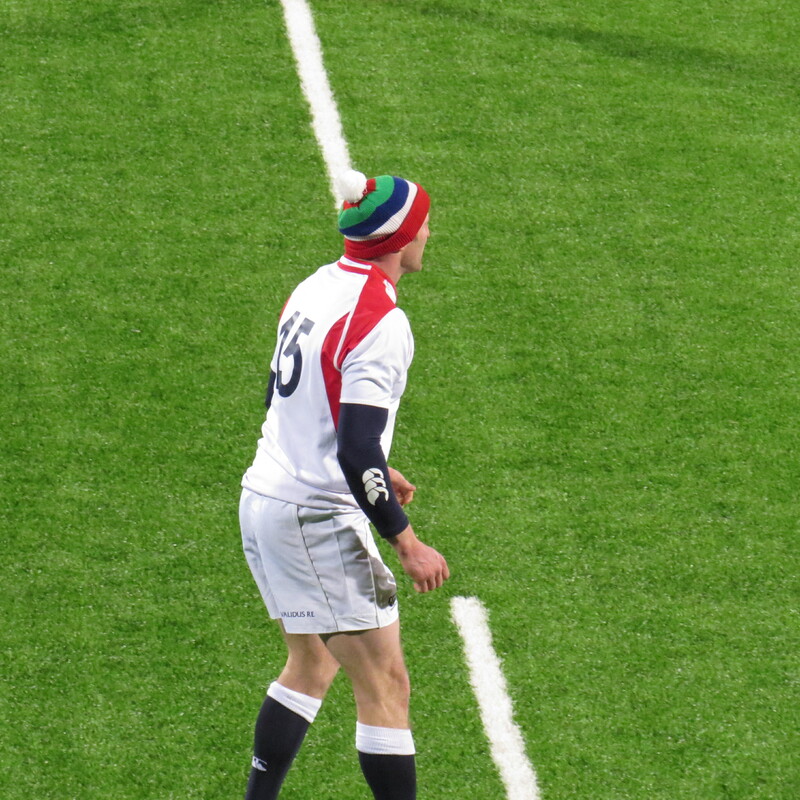 As usual with this 6 Nations for me – we missed the anthems! Food was much needed and what better than a traditional Irish Stew? It just had to be done and very nice it was too. 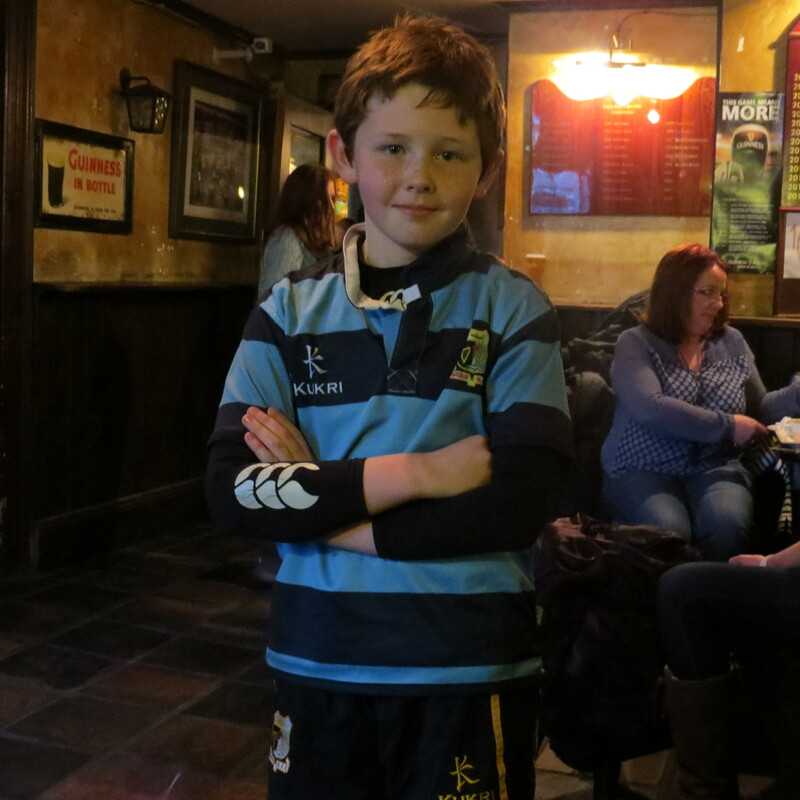 I met one of the starts of the half time entertainment in the Pub – one Max – a player for Navan RFC Under 10’s – he very kindly posed for a photo. I hope he enjoyed his run out during the break. 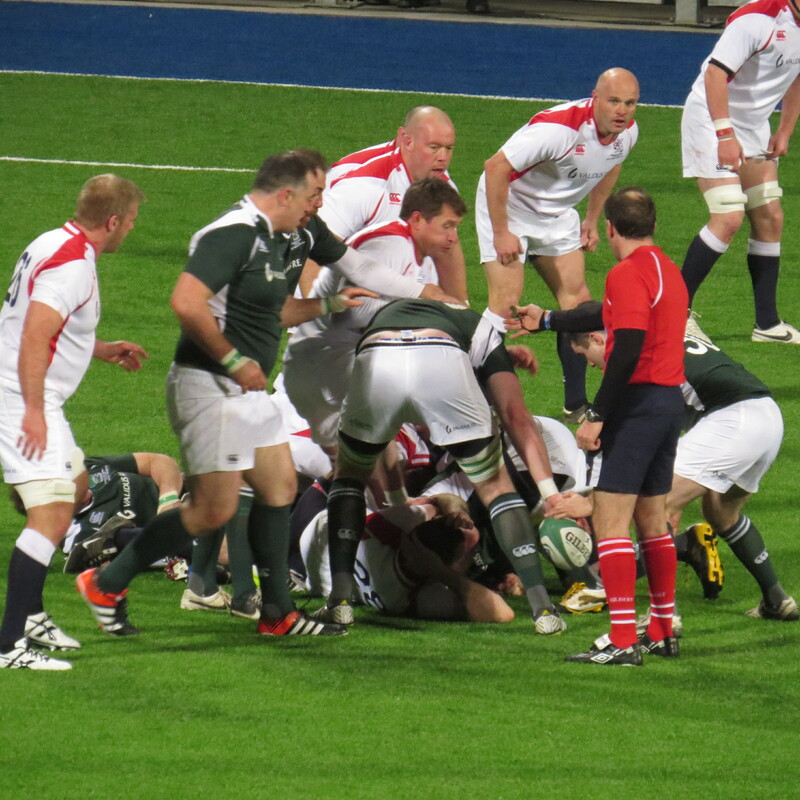 Another low scoring tight game saw a Welsh win in Paris – leaving the door open to a decider should Ireland beat England at the Aviva. With another set of brilliant timing match wise the end of the game in Paris was perfectly timed to go and get comfortable in the stadium. 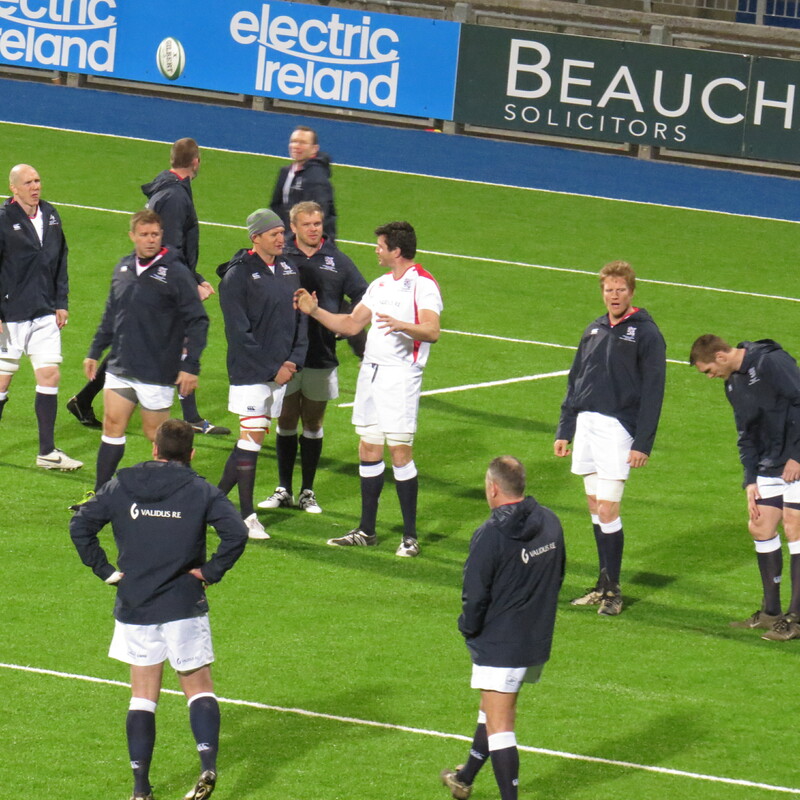 The 1st person I spotted warming up was Hugh Vyvyan, he’s a man who is very easy to recognise. One of the 1st people I interviewed, it was great to see him there! 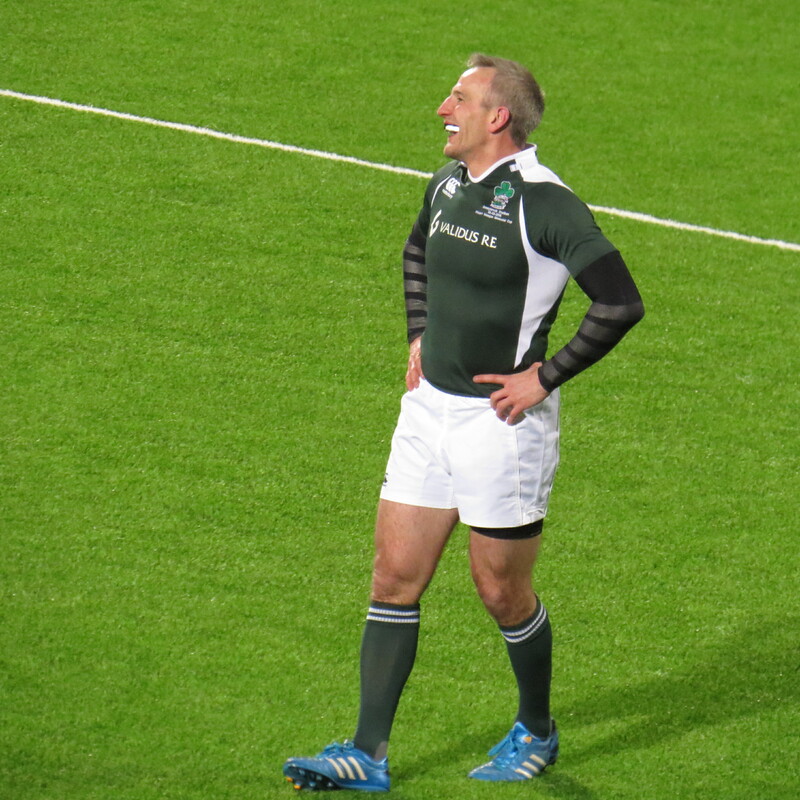 I’d never seen international Legends rugby before so had no idea what to expect – there were more than a few ‘shaved’ heads, several waists had expanded over the years and the odd grey hair was on show. 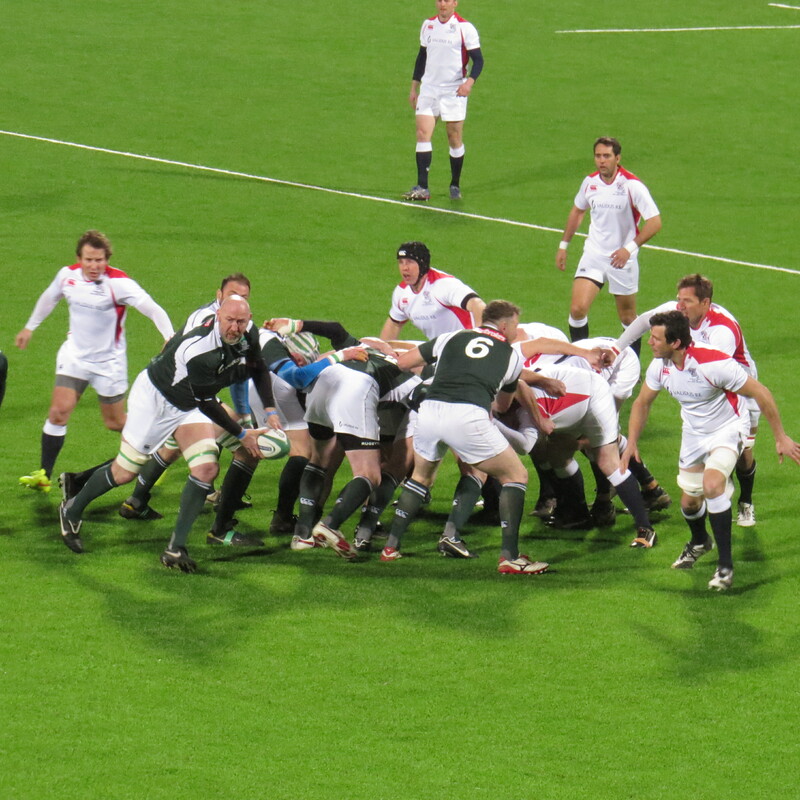 The game was played in two 30 minute halves and they were full of fun and entertainment as well as some pretty good rugby. 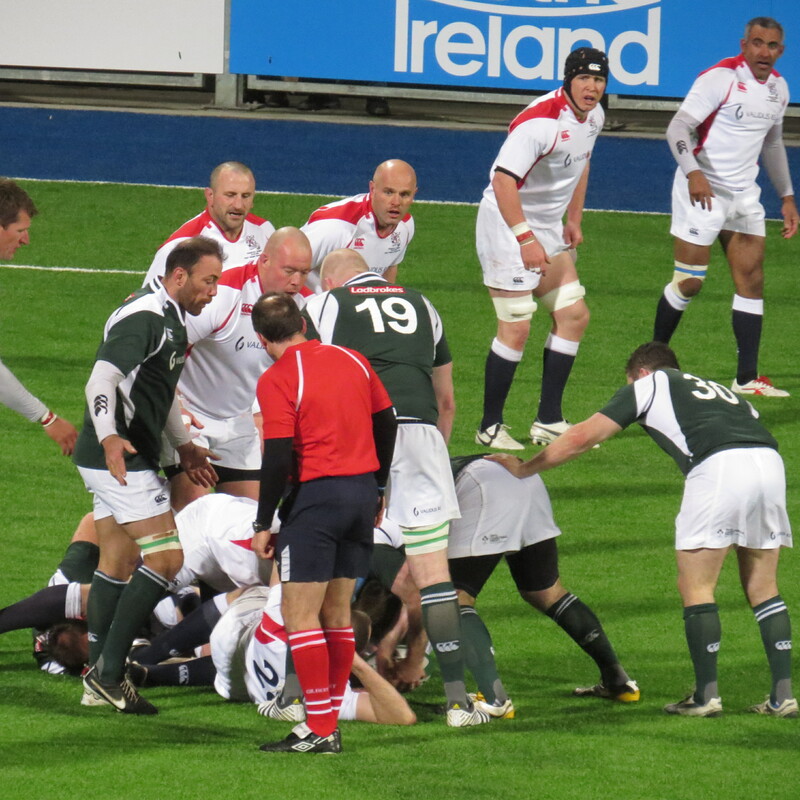 I’d describe the Irish mode of play as based on the bees round a honeypot style, for a while it looked like grown men reverting to the rugby they will have played when they started out. 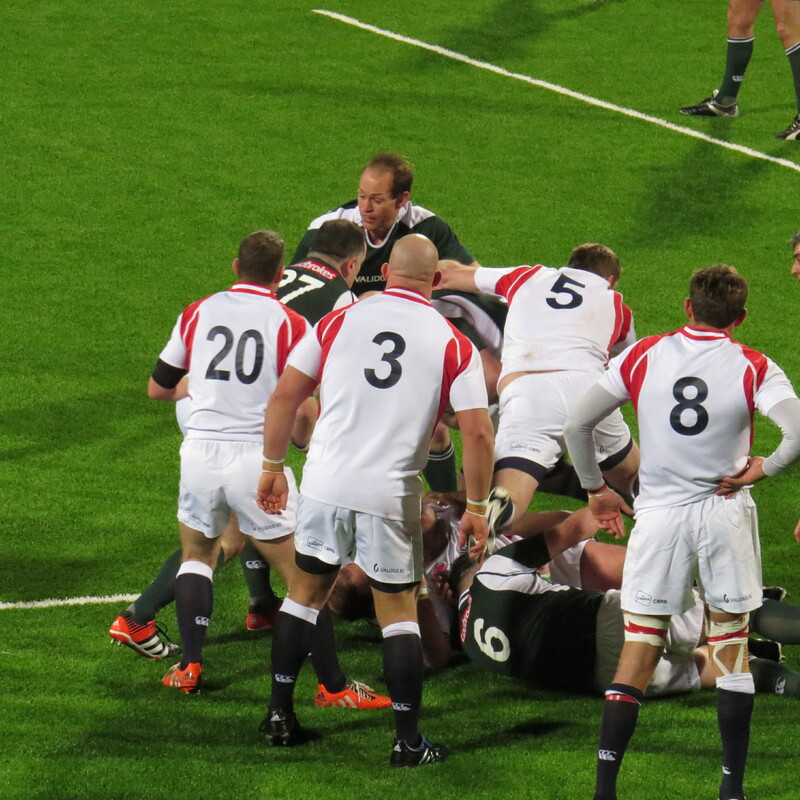 England took advantage of all that space on more than one occasion to run in tries. 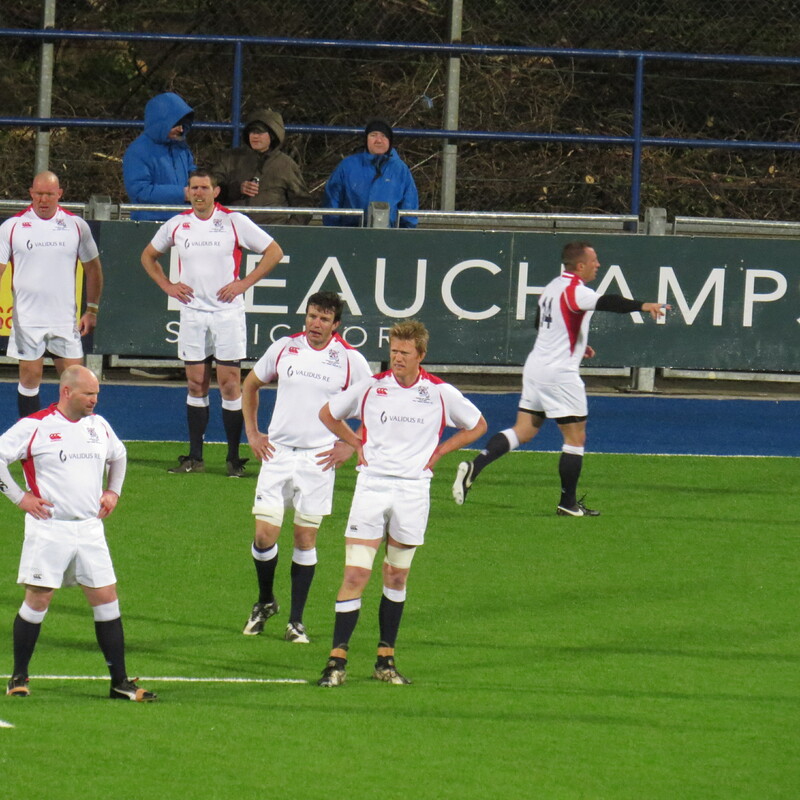 Hugh scored his own try too which was very well received – I typed (apologies Hugh) – Hugh Vyvyan scores!!!!!! Looks shattered!! He had a bit of a rest after that one. 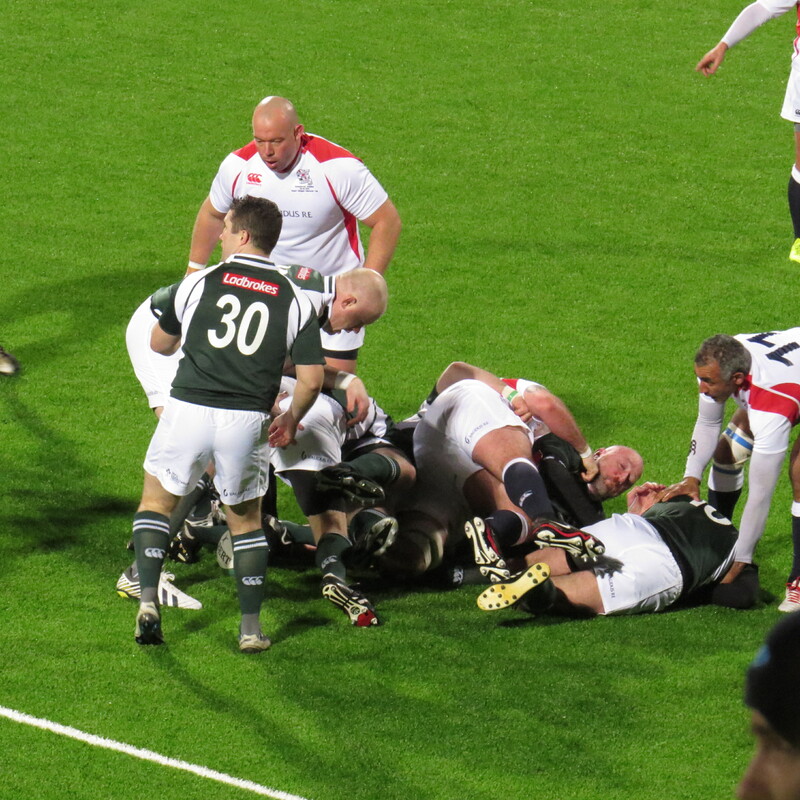 The referee Alain Rolland was responsible for two of the funniest moments of the game – he scored a try!!! Naturally given by the referee….. 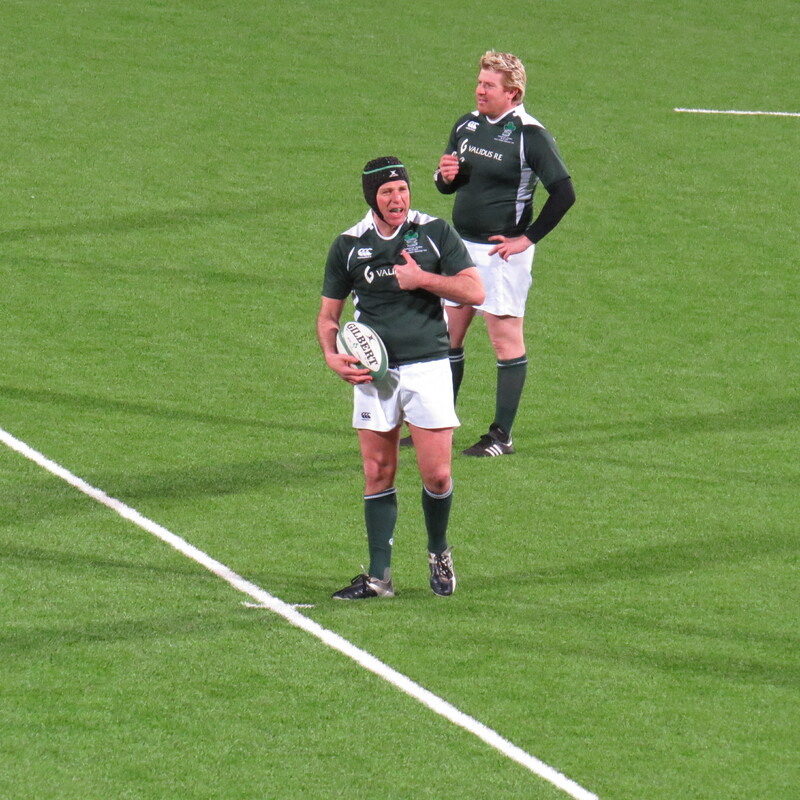 He also gave a penalty try to Ireland for no particular reason. 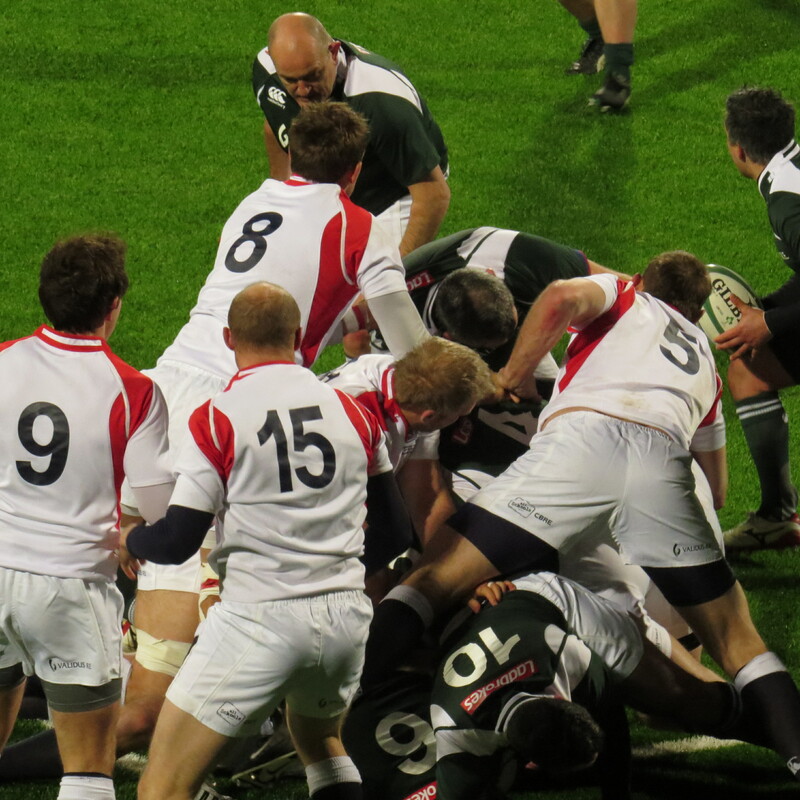 Although the game was played in good humour and was a whole lot of fun, both teams wanted to win. 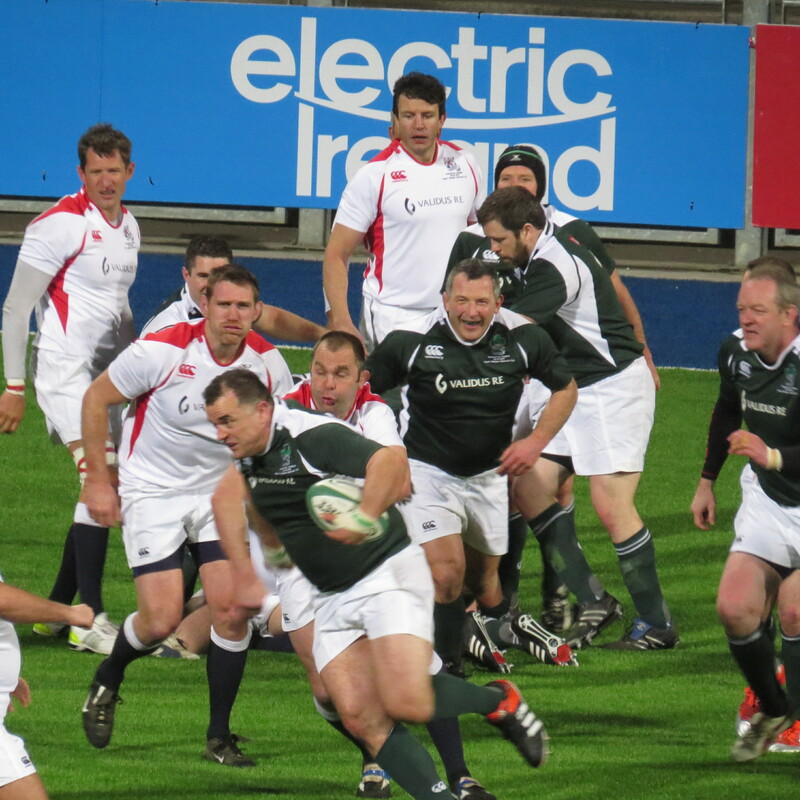 The eventual score was – Irish Legends 34 England Legends 58. And the Man of The Match? None other than Hugh Vyvyan! 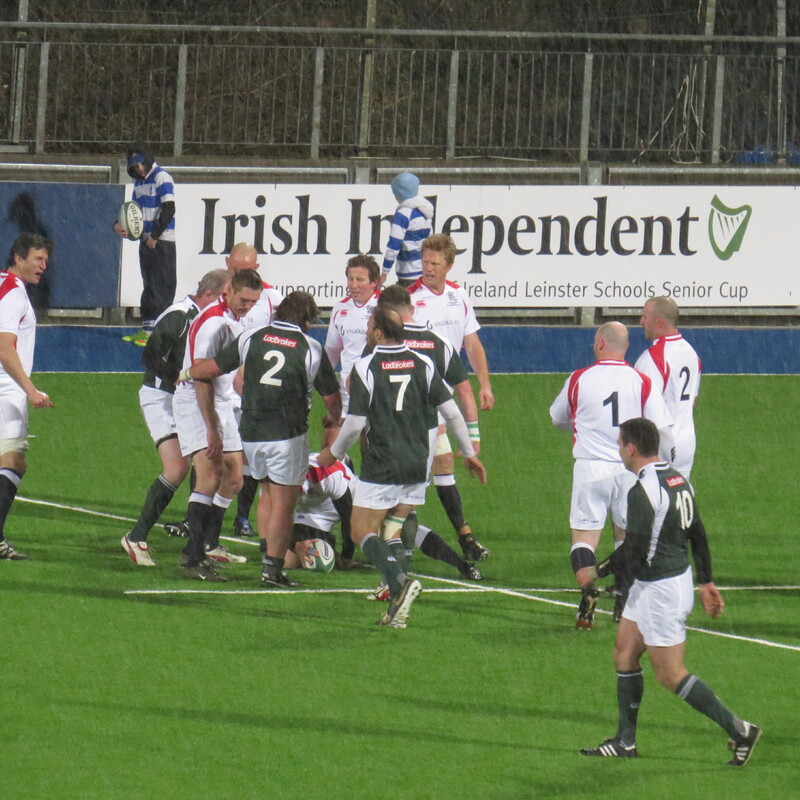 That was my first international legends game – it certainly won’t be my last – the whole thing was thoroughly enjoyable! Players may have retired, some have changed in shape, but what was blatant was the inherent skill and class on show. Having been to the pub before the game no food, drink or in fact toilets were needed so nothing to report on that one. So by way of a list – a roll call of the teams. A small footnote – we sat in the stand when it was quite empty – it soon became apparent that a family had come together. 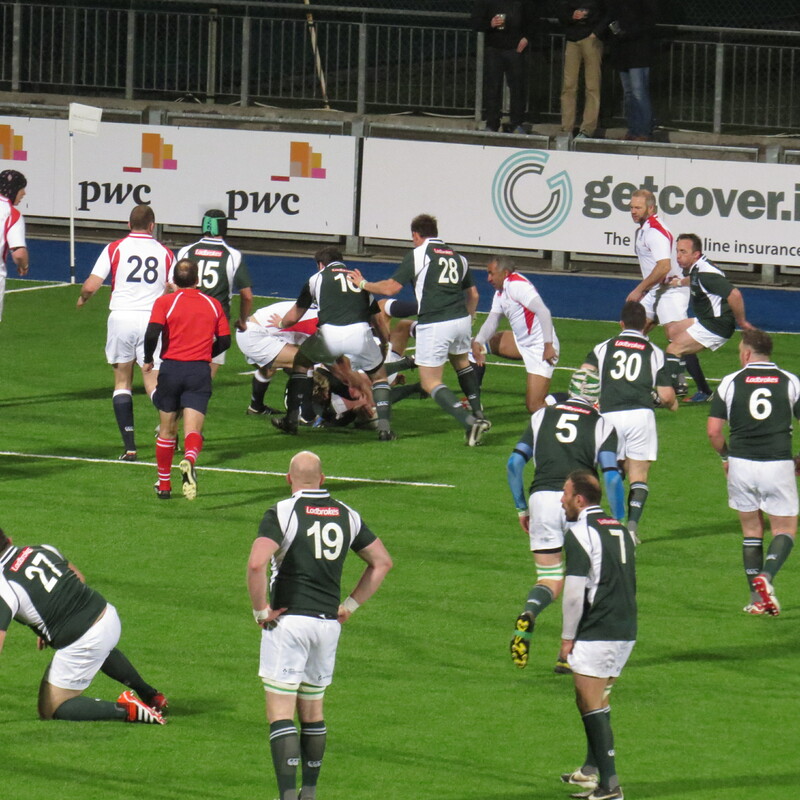 So naturally we moved – there were 16 members of the family there to watch Irish prop Nick Popplewell play. What a delight to see so many people out to support. And what a lovely surprise to discover one of the lovely ladies Sarah and I followed each other on Twitter! What a small world this world of sport is!